Shown at Innotrans and IAA, the new range of Speedlite compressors from Bitzer represent a step change in weight compared with their predecessors. The ELV21 and ELV51 series electrically driven semi-hermetic scroll compressors for bus or rail use are optimised for noise reduction in roof mounted applications and suit a variety of refrigerants. At 10kg, the ELV21 series is almost half the weight of its predecessor for cooling output options up to 5.5kW. The larger ELV51 series at 20kg is intended for applications up to 27kW. Both series incorporate seamless capacity control from 2,000 to 9,000rpm through the integrated frequency inverter. Eberspächer’s stand was in Hall 16, reflecting that the company is a major supplier to the truck industry, particularly of exhaust systems. Their latest innovation was also aimed, initially at least, at the truck market but may have wider applications. This was a diesel powered fuel cell for applications where vehicles would otherwise be left with a main or auxiliary engine running to provide an on board electric supply. Diesel fuel is burned in a controlled environment and the combustion products passed across a catalyst to silently generate electricity. Primary use is expected to be in the United States from 2017. 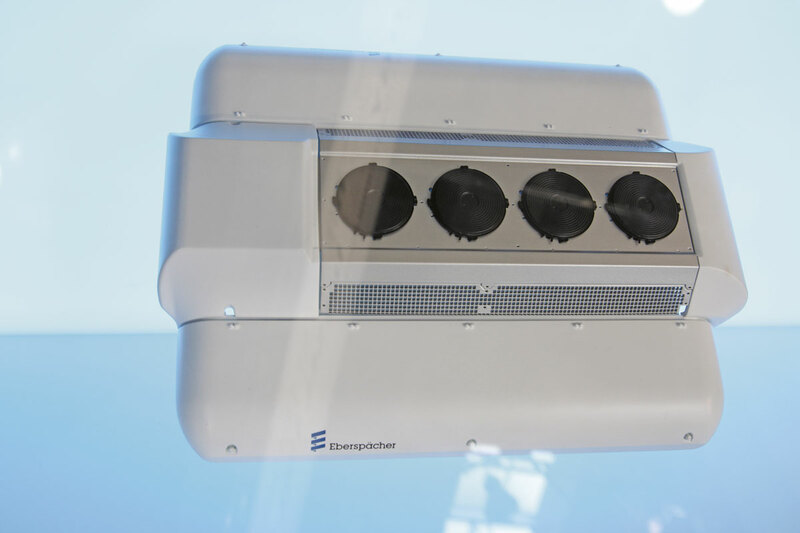 Aimed at electric bus application, Eberspächer Sütrak has further developed the AC136 air conditioning unit to include a heat pump. This enables it to deliver both heating and cooling in a lighter package. In heating mode, the system cycle is reversed to triple the effective heat output from the electric power consumed compared with direct electric heaters, reducing the impact of the heating load on the installed battery capacity. The first ten units of the AC136 AE Heat Pump are intended to be installed in vehicles for Finland with others planned for the Bruges electric midibus and various US projects. Konvekta reported further progress with the introduction of CO2 refrigerant in conjunction with a leading OEM. The company’s range of air conditioning units has been further developed to reduce weight and ease access for servicing. The roof top mounted Streamline 700-900 series is now 10% smaller and 20% lighter than its predecessor. 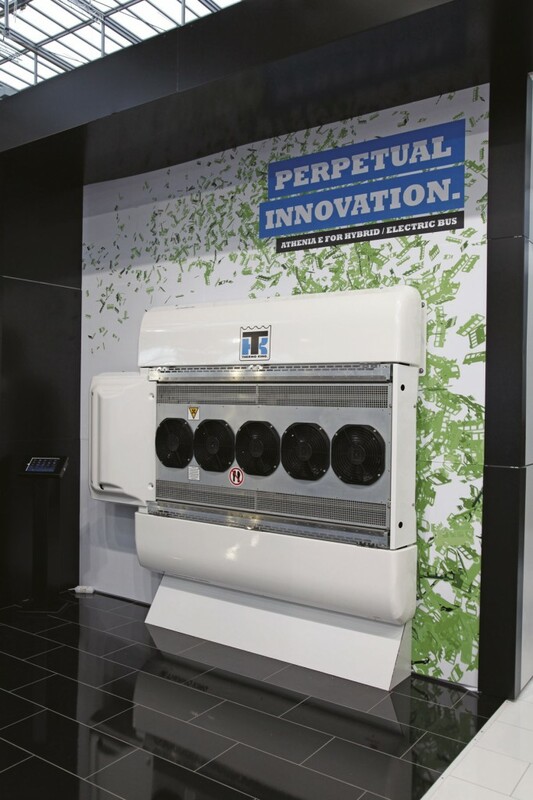 With high performance insulation, the fully recyclable Ultralight 500-900 2nd Generation now uses 10% less refrigerant for the same cooling output. KSPG AG, parent company of Rheinmetall’s automotive sector, supplies a wide range of engine componentry and systems to OEMs across the world. Recognising the continued electrification of vehicles, the company launched a new integrated heating and cooling module with heat pump intended as means of range extension for battery electric buses. Spheros introduced an alternative approach to the IAA, using their stand to promote dialogue with manufacturers, operators and service companies on the basis of a series of provocative questions covering the key issues of the industry rather than a display of hardware. Spheros have developed the REVO-E rooftop air conditioning for hybrid, electric and trolley vehicles with a cooling output of 25kW and the company’s patented mounting concept intended to keep the compressor vibration free and quiet. Options for battery cooling and reverse circulation heat pump operation are available. Spheros are also developing their Thermo H combined electric and diesel heater which supports emission free pre-heating of vehicles and booster heating at low outside temperatures. For 2014, Thermo King concentrated its range of products on one stand, located with other truck refrigeration suppliers in hall 27. For PCV applications, the focus was on the Athenia E for hybrid and electric vehicles. Equipped with a horizontal scroll compressor to minimise vibrations, the design is compact to recognise the need for other roof mounted equipment and features micro channel condensers to minimise the refrigerant charge. For 2015, Thermo King is further developing the unit to provide a full systems solution with heat pump and battery cooling options. Having acquired Diavia from Delphi Italia in 2012, Webasto are now able to offer complete heating and air conditioning packages for the mini and midibus markets in addition to their well respected heater range. Two basic designs of rooftop units are offered, 4-9.9kW and 10-18kW with a range of model names indicating the specific output and optionally included heating capacity. Alternatively Webasto offer components for integrated systems up to 16kW, suitable for midibuses up to 25 seats. Several Chinese air conditioning component and system suppliers showed their products at IAA. With the European manufacturers in hall 11 was Guchan who supply 80% of Yutong’s requirements and have developed a DC electric system for Hong Kong’s trams. Opat featured in one of the Chinese suppliers groups found in several locations across the site. The company produces around 4000 units per year for vehicles from four to 16 metres, supplying some to Spain and Italy. Flying the UK flag, Ashtree Glass and Amber Valley Developments teamed up again in hall 11. 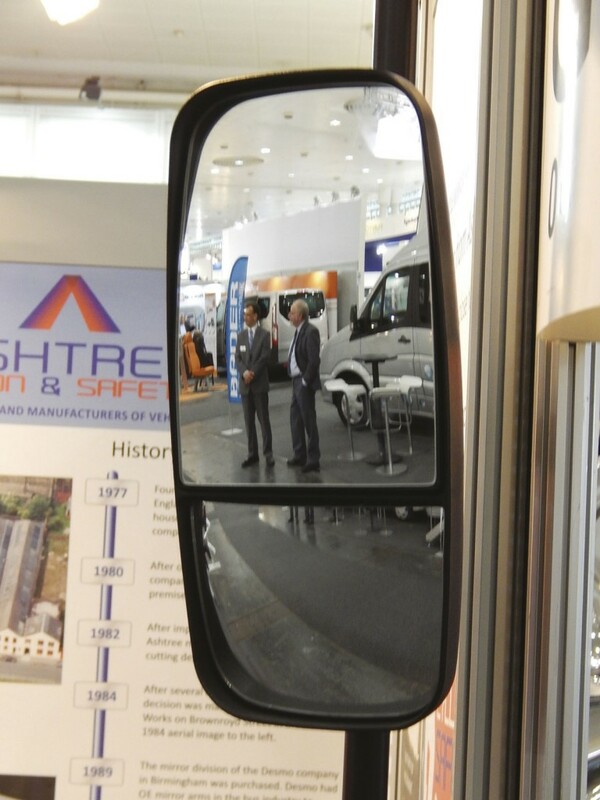 Ashtree Glass showed their new twin lens Cyclesafe mirror primarily for bus applications. Both lenses are adjustable to overcome black spot issues and the unit is suitable for any mirror arms from 16mm to 28mm diameter. Compared to electronic systems for improved black spot vision, it is failsafe, takes very little time to fit or replace and requires no system training. Ashtree Glass also offers unbreakable mirror options, demonstrated by a sample with a number of bullet holes through it! Amber Valley Developments specialise in vehicle safety equipment, particularly in support of reversing movements. IAA spotlighted the new Alarma Light reversing alarm that combines an audible warning with flashing high intensity LED lights. The warning can be an alarm sound or a voice message recorded in any requested language. Sweden’s Autoadapt completed the takeover of Unwin Safety Systems in April 2014 and relocated their UK support facility to Unwin’s Martock premises from 1 October. The IAA stand featured a VW Crafter equipped with a range of the company’s products together with examples of Unwin restraint systems and wheelchair lifts from US part owner BraunAbility. An interesting experience was offered to visitors to the Ellamp stand where they were invited into a closed box designed to resemble a coach interior. Here a hostess demonstrated the company’s onboard systems which offer the passenger a range of control options for lighting and heating direct from their smart phone. Developed in Italy, the system also has a social media function to support interactivity between passengers plus wireless bell and seat belt warning functions. 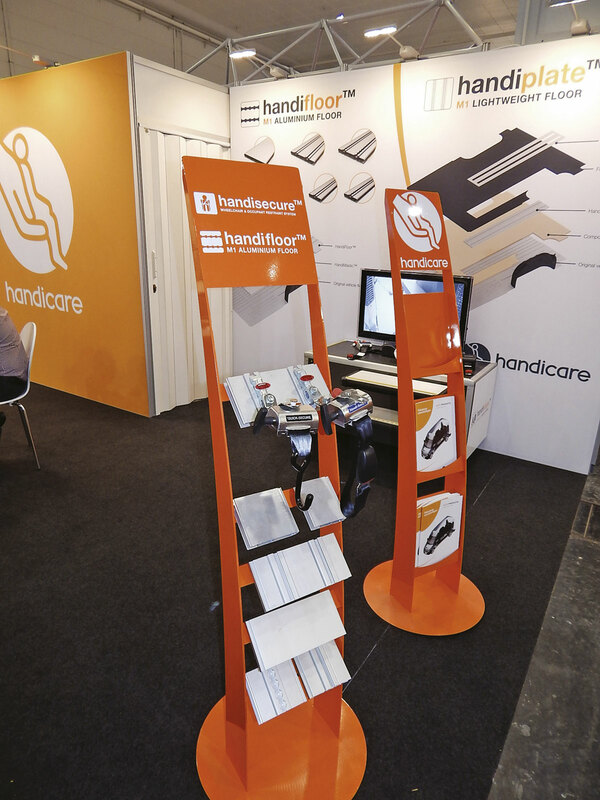 The Danish Handicare company showed a pan European range of products for transport of the mobility impaired including lifts developed and produced in Italy and seats from Portugal. The Handifloor system produced in Denmark is based on aluminium alloy sections giving a thinner and lighter floor and saving up to 40kg on a standard minibus application. 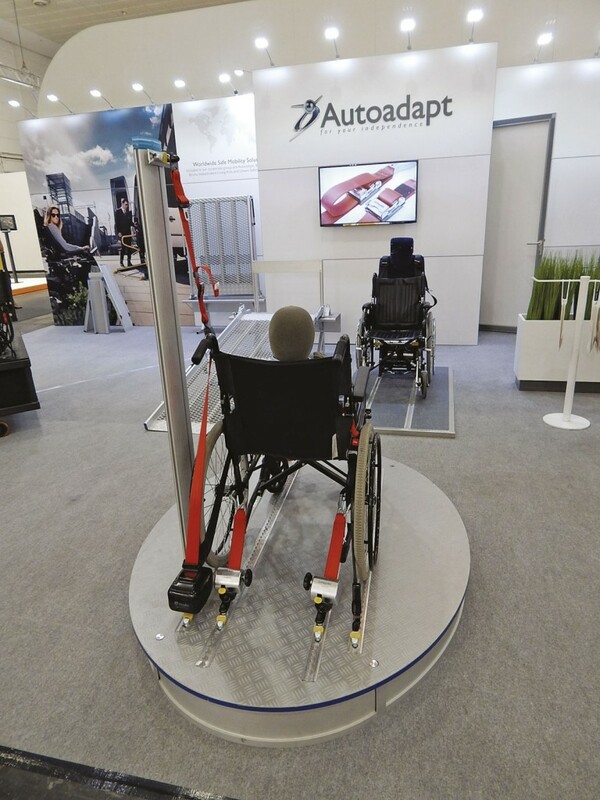 Handicare products also featured on the Schniele Seating Systems stand alongside the latter’s range of seating and restraint systems for mobility impaired transport vehicles. Schniele also showed an innovative flooring system based on surface finished composite materials and aluminium channels assembled with solvent free glue to provide a lighter solution. For high end applications of interior and exterior signage, Mobitec, part of the Luminator Technology Group, has launched Mobivision, a high illumination LED sign offering high resolution and incorporating a high computing capacity. Ethernet connected or updated by USB, the sign refreshes at 60 frames per second and has revenue potential through the display of position based commercials. It is available in various configurations for 24v operation. Access, the company’s back end content system software can also be used to validate the numbers of passengers who have been exposed to the commercials. Users of the Swedish developed system include Ikea for shuttle buses to stores in Oslo. Mobitec’s LED Ultima destination display is now available in a bluetooth version for direct updating from smart phones. The group recently acquired Axion Technology in Canada enabling it to add full CCTV systems to its portfolio. Group company, Lawo, shared the IAA display and had a presence at Innotrans with a wide range of mobile and static electronic display systems. MBB Palfinger showed the MBB Medirampe Euron at Innotrans, a fully automatic under floor mounted cassette ramp for low floor buses. Translucent articulation bellows were shown by Italian manufacturer PEI in conjunction with articulation turntables from ATG. The company co-operation started when PEI looked to diversify from its core machine tool protective cover market. Produced in Serbia, the bellows have already been supplied to Heuliez Bus in France in addition to manufacturers in North Africa and South America. Ventura Doors’ well known display unit equipped with a variety of the company’s products showed new control systems for all electric operation with the option of single leaf opening controlled by the driver or passengers on a multi leaf door. Continental launched its ProViu Mirror, a backward looking camera system as an alternative to conventional mirrors. 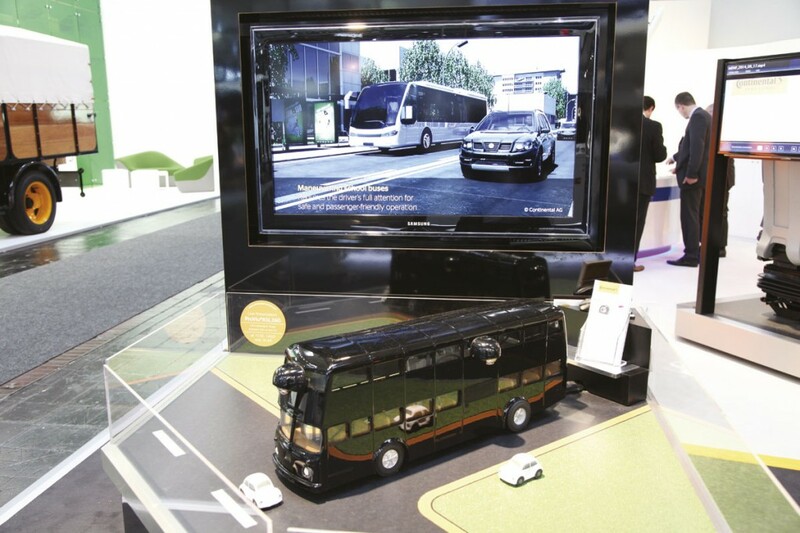 An interactive display based around a model of an old Berlin double-decker bus served to give a live demonstration of the ProViu system, in particular its ability to show activity all around the vehicle including what would normally be blind spots. Exclusively exhibiting at Innotrans, Init announced new real time information systems and the development of a platform for vehicle health and driver behaviour management. DEPARTURESlive is a real time application for iPhone that displays the nearest stops with departure times by list or map view. An augmented reality option using the iPhone’s camera gives a view of the nearest stops and links to a pedestrian navigation feature to reach them. MOBILEmodi adds an Android based solution for supervisors to Init’s fleet management system giving them the ability to view vehicle positions from any location, useful in managing traffic disruption situations. MOBILE-ECO2 will monitor driver and vehicle performance, giving immediate feedback to the driver through a bank of 5 LEDs. Data is fed back to the control centre in real time where reports can be created for training and development purposes. Initial development trials for the system are taking place in the USA. Fleet management systems specialist Mix Telematics unveiled a series of developments to their products including a revamped back end system and user interface. The HOS and remote tachograph data download solution is a comprehensive electronic toolkit, which enables the monitoring of drivers’ working hours in real-time and the automatic calculation of remaining driving times according to European law. MiX Vision has been enhanced to incorporate audio and infrared as well as images of the road and driver. Added to higher quality footage, more informed decisions can be made following incidents. MiX Vision videos can be viewed alongside a timeline within MiX Fleet Manager, adding additional context to incident scenarios. The latest addition to the MiX Rovi family is a rugged in-cab terminal that is designed specifically for demanding working environments. It features messaging, navigation and driver feedback on a seven-inch colour touch screen running the Android operating system. The Stoneridge stand featured a demonstration of their FCD4 fully configurable dashboard. 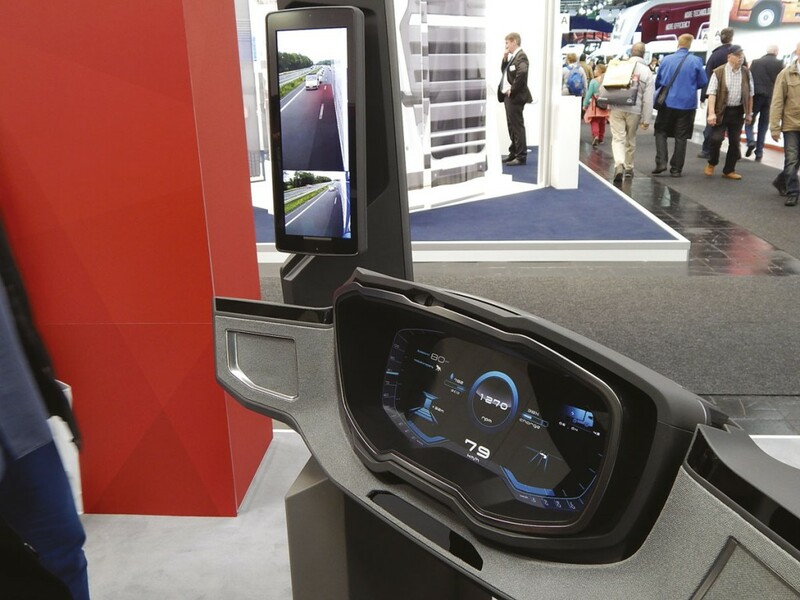 In addition to standard dashboard features, this incorporated the company’s integrated electronic rear view mirror system MirrorEye with eye tracking. This replaces traditional mirrors with displays on the A-pillars, reducing drag and supporting the removal of blind spots. The system detects approaching vehicles and alerts the driver with a warning blink in the mirror display. This is cancelled by a glance at the mirror detected by the eye tracking system. Initially intended for truck applications, the in dash system included further apps including one advising the driver of his available driving and break times. 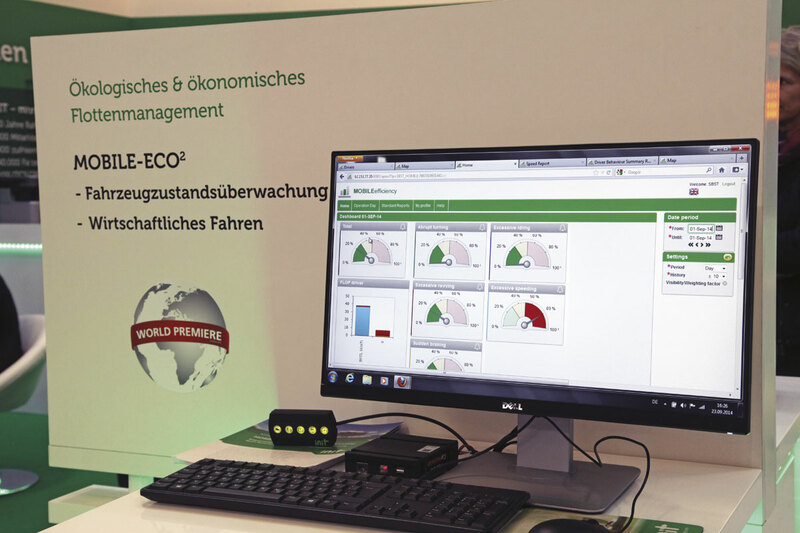 At Innotrans, Trapeze demonstrated its cloud based solution aimed at small and medium enterprises. Use of the cloud for IT infrastructure and data handling offers operators flexibility, scalability and high system availability levels with seamless updating. Trapeze is working towards a full Cloud Computing option with software giving operators a virtual control centre at any location. Michelin launched two new products for the PCV market including the Michelin X Multi Winter Z winter tyre for full size buses that will be at dealers ready for the forthcoming winter. Available in standard 295/80 R 22.5 size, it is intended principally for the steering axle but can be used all round. The company claims the new design with double waved tread offers up to 5% shorter braking distance and up to 10% longer life than its XFN predecessor. For midibus applications, Michelin has introduced the Michelin X Multi Z and Multi D ranges of all year round tyres offering longer life and quieter running. Initially in size 285/70 R 19.5, the Multi Z is designed for the steering axle but can be used all round whereas the Multi D is intended for the drive axle. Further sizes will follow. The Dekra group is a German specialist services organisation with a wide ranging international portfolio focusing particularly on compliance and safe operation. It is probably best known for its vehicle inspection facilities but this is only one of many areas of activity. Of particular interest on the Dekra stand was information on the training programmes provided for the Driver CPC in Germany, these set out a clear subject programme to be completed in 35 hours over five years with a mixture of practical and classroom training. For truck operators, Dekra also has mobile driver simulators to support some modules of the training. 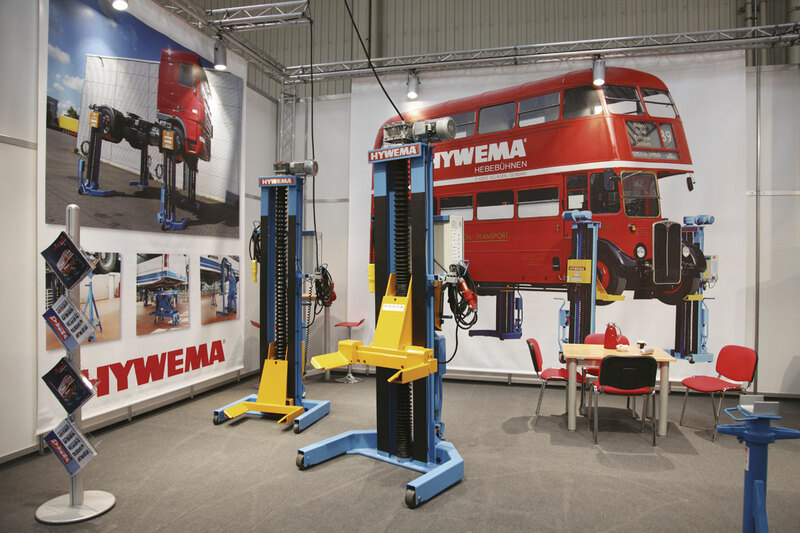 Hywema continue to offer a range of flexible lifting equipment suitable for use within and outside workshops. The company’s stand was dominated by an almost life sized image of their London RT bus which is now cared for in a Wuppertal museum. One of the challenges of electrification of public transport is the need to use transporter vehicles to move vehicles between locations. This was well illustrated at IAA with the arrival of the Solaris Urbino 18 electric artic for Braunschweig on the first day of the event. It was delivered on a Polish lowloader. Railway and light rail operators already make considerable use of specialist road transport services and a number of such organisations were represented at Innotrans including Kuebler Spedition. The IAA traditionally hosts a display of historic vehicles and this year many of the vehicles had arrived in Hannover at the conclusion of the ‘Tour der Deutschen Einheit’ rally that saw them travel around Germany for nine days. A small number of coaches took part and were joined in the IAA display by a prototype Neoplan N4114DES diesel electric fully low floor bus built in 1998 that operated for a number of years in Nuremberg. Another historic Neoplan, one of the eleven articulated double-deck Jumbocruisers and now converted to the world’s largest motorhome was used as a hospitality unit by bus dealer Omnibushandel Mario Roettgen (OMR).